We are back in Japan, to witness the grace, elaboration and refinement of a tea ceremony translated into the art of whisky blending. 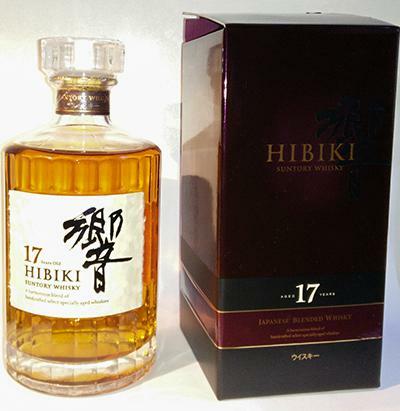 The aroma of Hibiki 17 is elegant, complex and floral with exotic spices, green plums and notes of old wood and leather. Distant charcoal, honeycomb and hints of tobacco round off the nose. Bold, intense oak flavors dominate the taste, taking turns with plum sourness, sweet nectarines and fresh mint. Although a little weak in its savory-dry 'matcha green tea finish', it still is a skillfully blended, adorable Japanese dram. First comes to me candle wax. Then comes a slightly fresh breeze, in the form of some menthol. The whiskey itself smells very light. Just do not think that has more than 46%. I find my honey and something like warm lemon tea. But there is still a sour note that raussticht, but does not fit into the picture. Got some fermented peaches in a plastic barrel. The longer it stands, the more acidic it becomes. But it comes through caramel and hazelnut. I'm not even sure if this is a Scottish whiskey. A fine flag of smoke lies in the background. If it gets even more time in the glass, light currants and gooseberries are noticeable. Some sweet vanilla comes through. And again fermented fruit. In the taste but rather the berries. Plum comes through. But immature. It will then be more woody. Short to medium. Bitter and dry. In addition a dry wood taste with a little ginger. Never before have I had such an intense floral scent in my glass, my nose is the absolute top hammer! Unfortunately, taste and finish can not keep up the stakes. 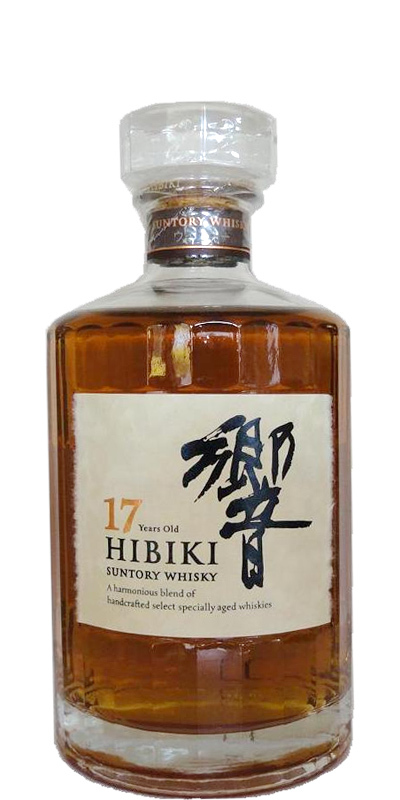 Overall, however, remains a great whiskey, but unfortunately now - due to the discontinuation of bottling and the general trend among the Japanese - has become disproportionately expensive. grated orange peel, sweet honey, then a little banana, the mouth is slowly drying, the oak pushes forward and then goes into ginger. Rather long, the fruit stays with me little back, rather bitter notes in the direction of bitter very dark chocolate. A certain fruity note comes up in the meantime. 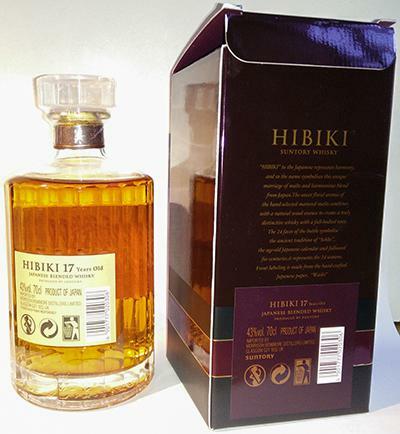 Hibiki 17 year old is quite lovely. There’s oodles of character here, from the inviting nose, through to a lovely fruit-driven development. There’s also plenty of balance and poise – every component being exactly how it was designed to be. Whilst the NAS Hibiki expressions feel somewhat manufactured (albeit generally well manufactured), at this age, the blend starts to feel much more naturally composed and confident. Of course, with the discontinuation, acquiring this outside of auctions is now akin to hunting unobtainium – and it has been far from easy (or cheap) for a number of years already. In the writing of this article I checked the most recent auction price for this bottling and found a jaw dropping £380 (plus fees). Quite lovely, but now quite ludicrous. Expressive and highly appealing. Honey and orange peels are joined by polished wood, incense and sandalwood. Lively fresh tropical fruits – mango and roasted bananas – sit with light leather and tobacco. Already we’re playing around with sweetness vs. sourness. A syrupy arrival that’s got plenty of weight for 43% ABV. Orange blossoms and orange peels (quite unrelatedly) sit with tangerines and nectarines and our already identified tropicals – mango and banana. Starting sweet, but gradually souring in the mouth throughout the development, these also lend the whisky some progressive dryness. In the mid-palate, the grain element can be discerned – bright corns and maize alongside brass polish. It’s exceedingly well integrated. Woodiness runs throughout the whisky (though whether this has been in mizunana I’m unsure – possibly a time/packet of whisky) and expresses both sandalwood and spices – gently ginger, more pronounced cinnamon. Medium in length and packed full of slightly tart fruitiness, woodspice and cinnamon.